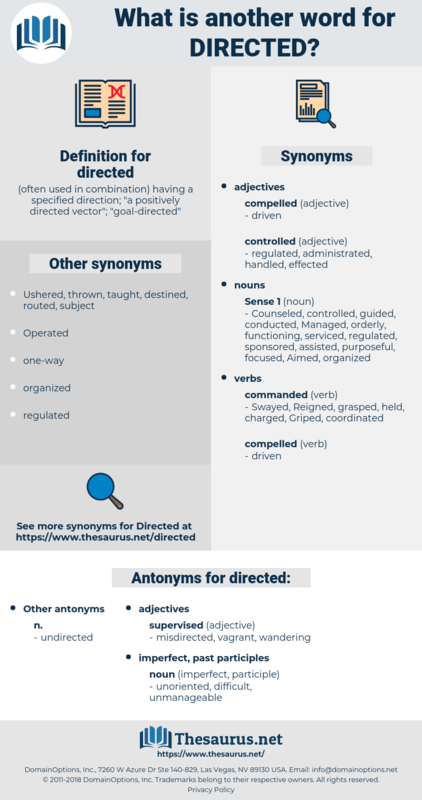 What is another word for directed? 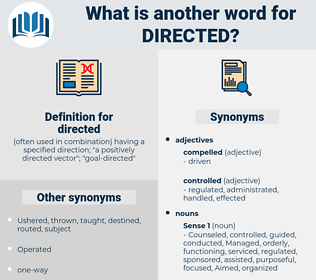 ( often used in combination) having a specified direction; " a positively directed vector"; " goal- directed"
indicators, Measures, Trustees, governors, direction, directions. concentrated, Disbursed, disclosed, Wrote, determined, described, administer, Indicted, Indicated, deducted, Introduced, cryopreserved, Testified, contact, decided, identified, guiding, guides, guidance, Presided, contacted, effected, demonstrated, dedicated, affected, Investigated, Mentioned, edited, Exacted, reflected, Contributed, centered, declared, received, impacted, dispatched, Attracted, circulated, appropriated, evaporated, Delivered, authorized, Discussed, considered, Enticed, projected, Attributed, empowered, constituted, Cited, Influenced, Steered, completed, Necessitated, devoted, Provided, advised, recommended, Rendered, recorded, centred, allocated, Undertook, conducive, encouraged, recognized, established, Establishing, anticipated, reported, included, Prosecuted, initiated, Explained, understood, informed, decreed, contre, Referred, clarified, contracted, nominated, Oversaw, transmitted, drove, Remitted, Examined, defined, conferred, Proceeded, Guidelines, Created, allocation, contrary, ruled, behaviour, governed, organized, Petitioned, Incurred, charged, entrusted, Encountered, Caught, Began, suggested, support, traveled, travelled, Inquired, enquired, ordained, appointed, strafed, Operated, summarized, Enshrined, donated, turned, expressed, Entered, executed, struck, mentored, utilized, conveyed, guideline, command, faced, outlined, involved, spearheaded, Instituted, Occurred, observed, imposed, invite, invited, mandates, invested, Delegated, chair, Chaired, proposed, Compared, Encompassed, Chose, blagged, affirmed, commissioned, Wondered, Stipulated, Channeled, Channelled, assigned, hired, Raided, leading, led, Commented, opened, Prompted, noted, Promoted, Suffered, Commanded, Arrived, extended, Reached, Told, Deployed, adapted, application, attended, accused, concluded, enlisted, Envisaged, resolved, Urged, studied, mailed, started, Resulted, Displayed, Issued, Returned, Commenced, engaged, arranged, designed, realise, Relied, regarding, Enjoined, forced, Convened, consumed, left, spent, Embarked, violence, headed, Submitted, levered, Brought, Was, Were, Shone, Shined, foresaw, Obtained, Filed, fired, assumed, read, learned, sequence, raised, Insisted, thrust, drew, Yielded, Versus, Questioned, Acted, Challenged, Debated, Spewed, announced, Approached, HIT, Served, granted, Caused, pursued, rigged, Performed, Queried, Leveled, Levelled, favour, pointed, saw, dreamed, requests, Threw, Warned, placed, Awarded, Flew, trusted, Earmarked, Lured, Carried, Tasked, Visited, earned, framework, Knocked, laid, at, spoke, Gave, shot, moved, Demanded, applied, Took, Worked, opposed, fulfilled, sponsored, loaded, Scooped, allotted, released, ask, Piloted, listed, Appealed, agreed, Wore, paid, posted, unleashed, stated, found, pray, Prayed, held, posed, Talked, Waged, hosted, Fought, said, who, formed, Knew, heard, pumped, put, Shipped, failed, called, calls, let, Looked, Walked, lf, Launched, Accounted, Went, figured, plan, felt, Hoped, Had, marked, mounted, Dealt, Ran, scene, thought, Got, pulled, Wished, manned, Meant, wanted, made, named, Him, moderated, Targeted, direction, addressed. Discriminated, restricted, predicted, distributed, corrected, connected, diverted, coordinated, co-ordinated, discovered, Criticised, criticized, credited, articulated, predominantly, interference, instructed, concentrated, dictated, Disbursed, selected, disclosed, written, characterized, targetted, centralized, ascertained, determined, Administered, described, Intentioned, rejected, elected, collected, strategic, Indicted, Indicated, predestined, deducted, infected, Disseminated, reallocated, Trafficked, protected, re-routed, Introduced, cryopreserved, incorporated, decided, Predicated, identified, Inflicted, information, rerouted, Activities, guidance, ducted, Subordinated, masterminded, reoriented, Seconded, principally, contacted, scattered, Adjudicated, effected, orchestrated, demonstrated, dedicated, discarded, illustrated, affected, Investigated, Mentioned, edited, intervention, afflicted, Exacted, reflected, cleared, educated, Extracted, Enacted, Contributed, communicate, Communicated, designated, discharged, centered, confined, declared, Exercised, received, impacted, dispatched, Recruited, Attracted, recognised, circulated, Constructed, appropriated, disposed, channelized, evaporated, respected, Delivered, authorized, Discussed, considered, acknowledged, Enunciated, reminded, projected, Attributed, calledfor, empowered, dismissed, manufactured, apportioned, Materialized, relocated, organised, Transferred, objective, consecrated, recourse, reference, referenced, Cited, emphasized, applications, Influenced, practiced, orientated, Steered, completed, Necessitated, devoted, forward, Provided, interviewed, destination, inherited, advised, recommended, Rendered, advertised, recorded, centre, centred, tender, regulated, Subjected, Generated, Explored, removed, entrenched, Exerted, inscribed, implicated, allocated, clustered, guaranteed, motivated, calculated, Ascribed, encouraged, evidenced, authorised, recognized, dominated, established, increased, located, anticipated, induced, ordinance, reported, included, registered, expected, address, Perpetuated, practised, altered, initiated, refers, Explained, Contemplated, Legislated, solicited, destiny, informed, decreed, Overseen, retained, notice, Referred, conquered, contracted, relevance, nominated, conceived, converted, divided, tied, transmitted, ioaded, harmonised, Remitted, adressed, routed, Examined, redeployed, detailed, Switched, defined, Culminated, Guidelines, Strived, Striven, Created, restored, despatched, contained, Comprised, advice, concerned, condemned, strengthened, Acceded, Perpetrated, Confronted, ruled, cost, ended, recovered, monitored, supported, Showered, Enumerated, governed, Deposited, organized, Petitioned, deferred, broadcast, Incurred, Consigned, charged, entrusted, interested, associated, Advocated, Encountered, cancelled, inspired, turn, Caught, admitted, suggested, Invoked, delete, support, master, traveled, travelled, insured, refined, enquired, accessed, enforced, stressed, ordained, secured, appointed, voiced, handed, split, Operated, Enshrined, touched, donated, turned, expressed, appreciated, Entered, experienced, executed, struck, mentored, surrendered, pledged, undermined, tailored, utilized, conveyed, Begun, liaised, featured, minded, utilised, Transported, endeavoured, presented, budgeted, endorsed, Compiled, composed, Purchased, Devised, obligated, mandate, Consented, face, faced, Consisted, Tackled, outlined, involved, trained, spearheaded, highlighted, taught, Instituted, Occurred, imported, fed, observed, documented, lent, chosen, imposed, invited, invested, Consulted, Delegated, sanctioned, printed, Arisen, Tended, Chaired, proposed, linked, desired, Emitted, cast, Compared, obliged, come, commissioned, Stipulated, checked, embedded, impaired, correlated, Channeled, Channelled, assigned, formulated, compelled, hired, financed, Exported, led, enclosed, finalized, opened, Prompted, pressed, postponed, Replied, Installed, witnessed, classified, Engineered, noted, Mobilized, Suffered, Notified, Commanded, leveraged, Arrived, extended, permitted, situated, Reached, Told, Deployed, adapted, Succeeded, attended, accused, seized, furnished, concluded, stored, Shifted, expanded, resolved, Postmarked, Followed, Urged, mailed, arrange, Forgiven, covered, started, Resulted, Displayed, Issued, Returned, sustained, heated, weighted, Worded, finalised, pursuant, Benefited, engaged, arranged, designed, changed, bound, attached, embodied, Enjoined, Drafted, forced, Convened, Compromised, scheduled, forecast, consumed, ensured, scope, left, born, Borne, foreseen, spent, Embarked, headed, inclined, maintained, Submitted, Espoused, exploited, levered, Brought, tilted, equipped, frozen, Tempted, Obtained, Quoted, set, mobilised, Filed, GONNA, adjusted, fired, assumed, drawn, copied, Afforded, learned, limited, raised, Insisted, Undergone, Slated, Attacked, thrust, rooted, assembled, Yielded, Helped, expended, Questioned, attained, Expelled, Acted, Challenged, Fielded, painted, announced, handled, exposed, Stationed, damaged, processed, supposed, Approached, seen, Bred, thrown, HIT, Served, satisfied, granted, Caused, pursued, acquired, Performed, Flown, Queried, Taxed, Leveled, Levelled, positioned, favour, Championed, phoned, Argued, shared, pointed, assured, opted, Progressed, door, Lodged, placed, treated, reserved, Awarded, filmed, trusted, Earmarked, filled, spoken, Lured, framed, Borrowed, Carried, Tasked, Anchored, added, skewed, given, absorbed, earned, Scored, Assessed, aligned, laid, fixed, uploaded, tabled, shot, Supplied, Offered, moved, versed, Demanded, Poured, signalled, taken, built, applied, seeded, Enjoyed, shaped, Allowed, fated, Worked, opposed, Coached, dropped, harnessed, fulfilled, dressed, sponsored, loaded, funnelled, delayed, liaison, allotted, released, Been, Piped, Summoned, blown, Accorded, geared, worn, Viewed, spread, Piloted, listed, needed, Appealed, agreed, paid, Mapped, staffed, staged, posted, suited, Spilled, stated, found, vested, Prayed, goal, sold, held, posed, Gained, employed, Waged, hosted, Shown, proved, proven, Fought, said, grown, doomed, formed, heard, played, put, Shipped, called, attempted, biased, planted, Looked, Launched, Accounted, Passed, mission, Happened, ranked, billed, sort, sorted, barred, tried, booked, founded, marked, gone, Dealt, Programs, especially, kept, thought, pulled, dated, shed, Meant, wanted, 'il, made, named, Him, structured, moderated, oriented, Targeted, addressed, guided. targets, Addresses, operates, realizes, heads, aims, seeks, goes. directing, oriented, Targeted, addressed, guided. Much further along, directed Jenny. His horses and equipments were then given to his staff - his papers directed to be sent to his wife. Dyer's Woad, drag out, draught, drogheda, dry socket, dearest, dark-coated, drugget, draughty, detract, drought, drugged, dress hat, direct, derogate, dressed, dress suit, druggist, dress code, diarist, dry-shod, drogue chute, dress out, direct tide, dyer's weed, direct dye.